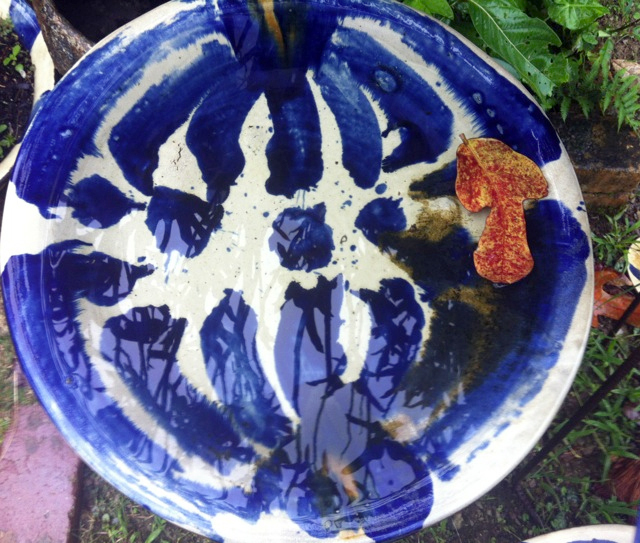 My circular vision started in Kyoto recently at the magnificent house and pottery of Kawai Kanjiro. 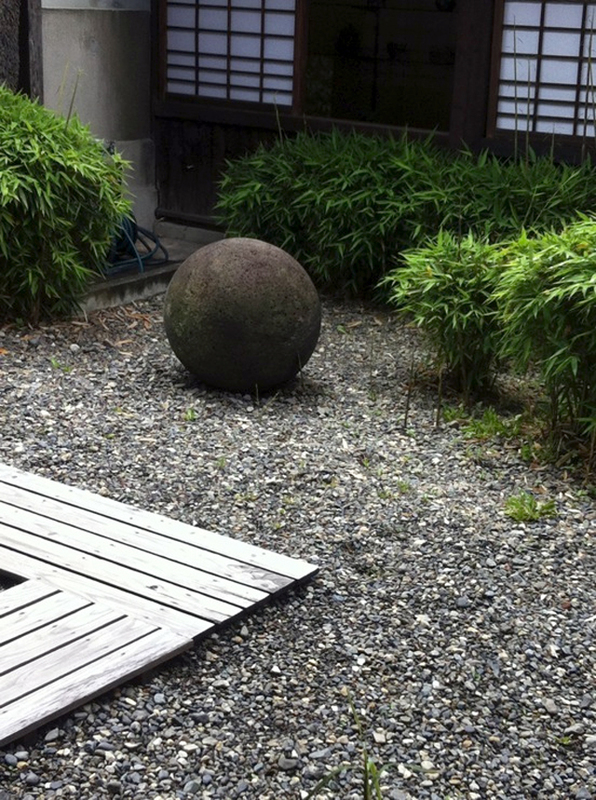 In his garden is this huge round stone, a house warming present to the potter when he built the house, a perfect expression of Japanese aesthetics in daily life. Japan is made up of all manner of shapes, textures and colors, of course, but last week in Okinawa, all I could see was circles. 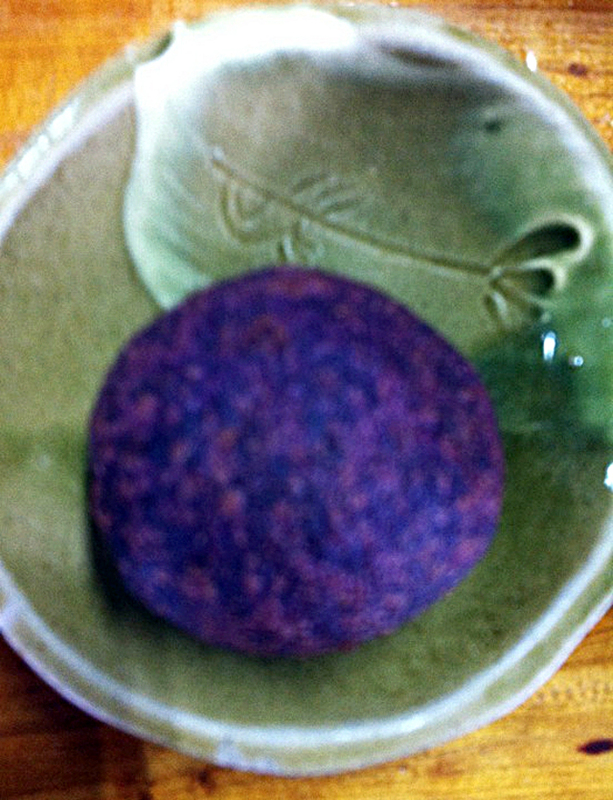 Everywhere I looked I found circles, from the colorful handmade plates, all different, all typically Okinawan at the always delicious izakaya/pub Yomitan Monogatari where we headed, just after arriving, to the fluorescent purple beniimo dumplings for dessert the next day at Yuimaru Cafeteria attached to the Yomitan Pottery Coop. (pardon the unfocussed photo. This cameraman was just too excited by the incredibly good purple dumplings). 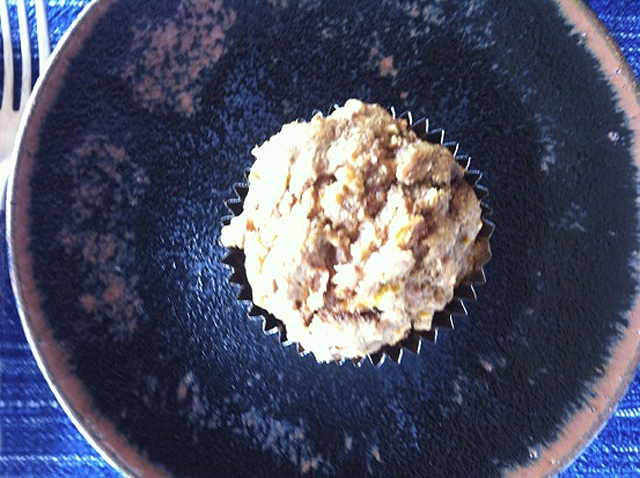 Breakfast each morning featured round Genki muffins bursting with nuts and raisins and grated carrots and bran lovingly prepared by our ever Genki hostess, her cheese soufflés if you will, and we did! were heavenly circles of well being. 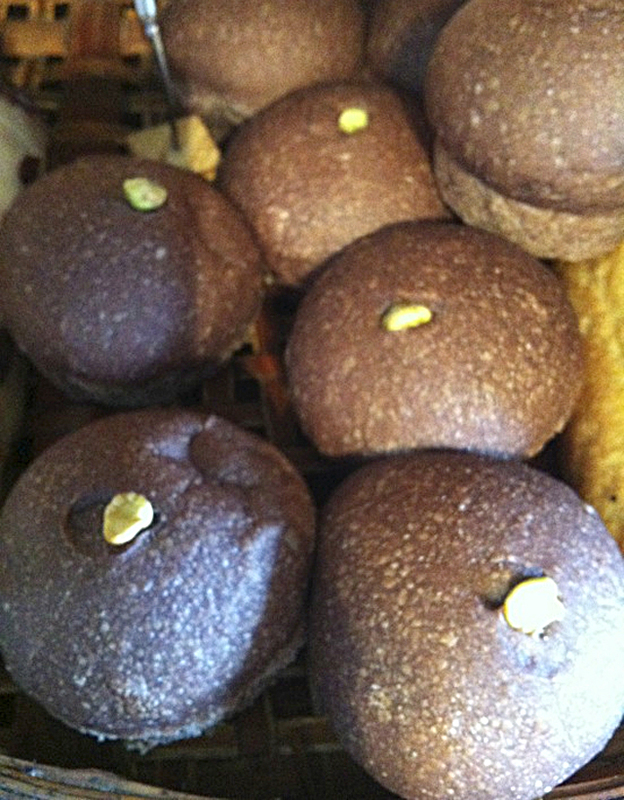 And the free will creations of TONARIYA Bakery in Yomitan who specialize in baking spheres of all flavors and colors. Their offerings changed every day and made it difficult to decide which round masterpieces to take home..
TONARIYA is open daily except Monday from 10 until they run out which is always early in the afternoon. HITSUKI (Sun / Moon – great name for circles!) 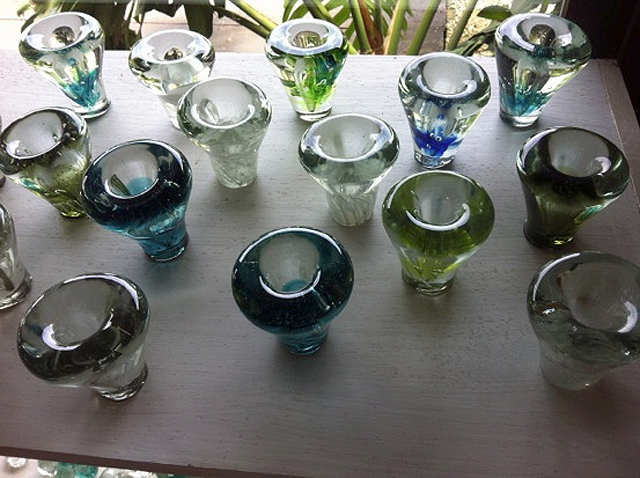 Glassworks in Yomitan makes incandescent circles. 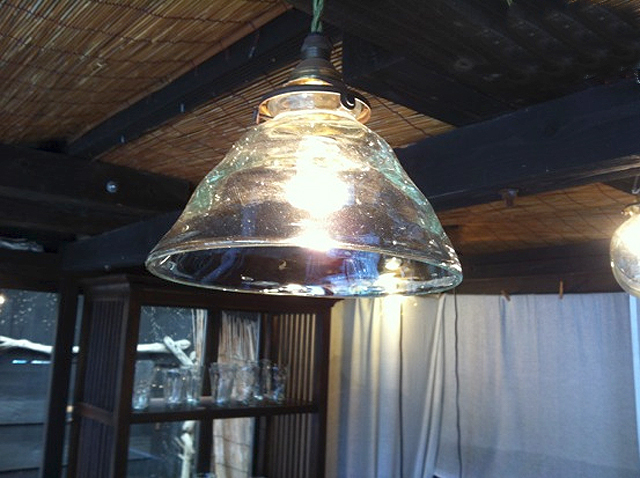 Their light fixtures breathe warmth into a room. 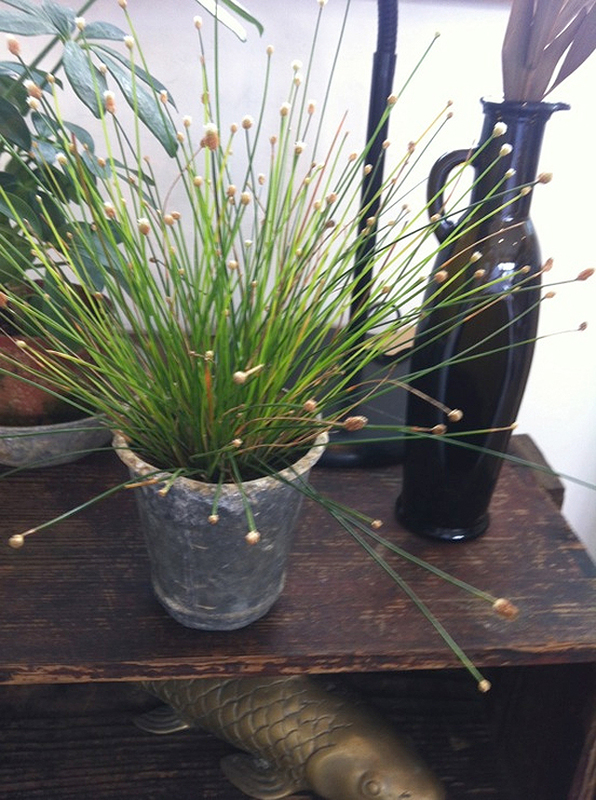 Their bud vases help flowers stand up and be noticed. 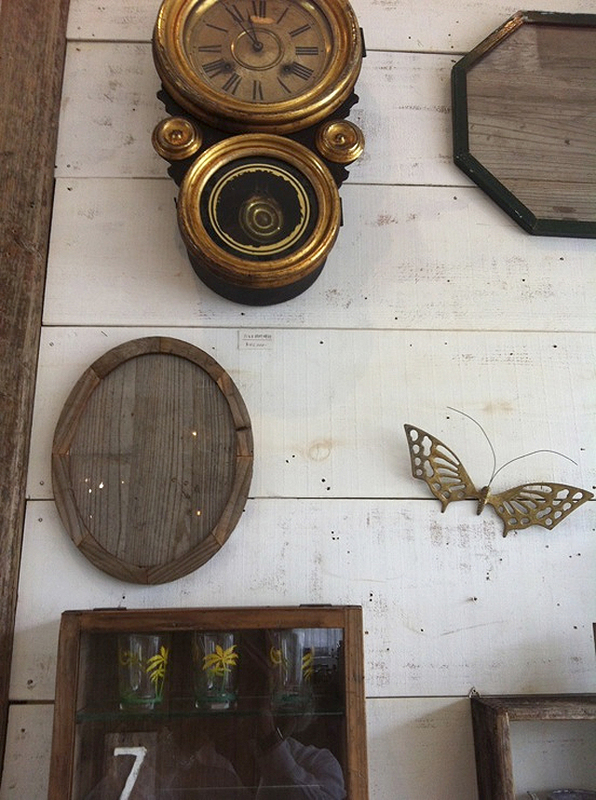 Circles at the new age antique shop INDIGO sneak up on you. They are circles without bragging about it. 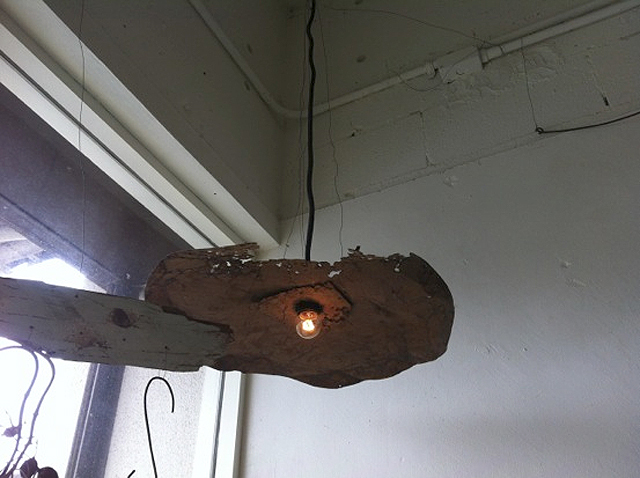 I have been coveting this rusted lampshade as long as I have been going there, but they treasure it as a symbol of their wabi sabi taste for living with the beauty of cast away objects of everyday life. Their brochure proclaims a wonderful philosophy: LOVE YOUR LIFE. Their shop proves that they do. As I love their assortment of workaday things that are loved. INDIGO Antique shop in Yomitan. Somehow the young owners of INDIGO with three little children succeed in combining things in exciting ways. I was dying for this plant, but they wouldn’t part with its partner pot. And the grouping of objets in an old box makes the whole composition shine under a basket sun overhead. And the grouping of random objects in an old box makes the whole composition shine under a basket sun overhead. 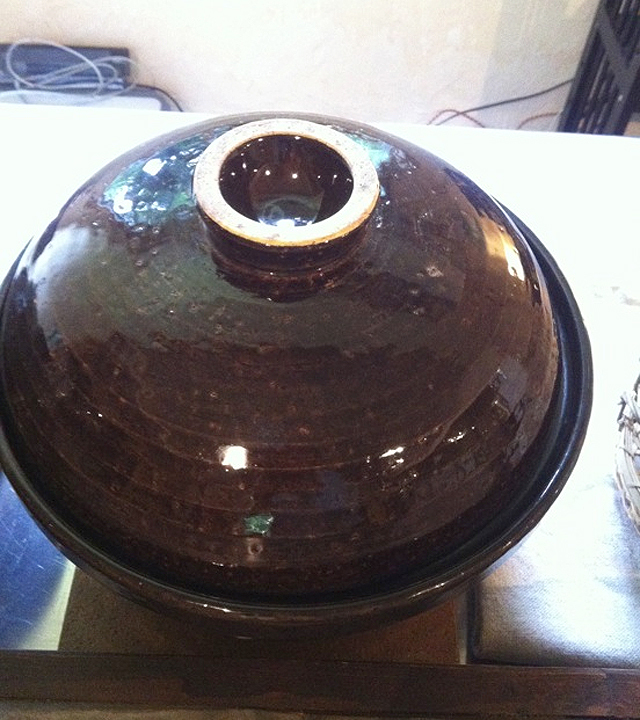 Bulbous rice pot for cooking perfect rice directly on the fire. 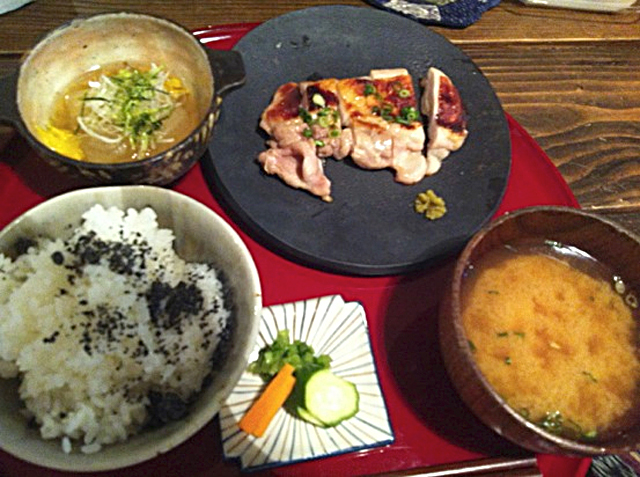 Delicious circles at KOme Matsukura in Urasoe, Okinawa, perfect rice and vegetables sublime from Miyagi Prefecture, in an artistic and original setting. 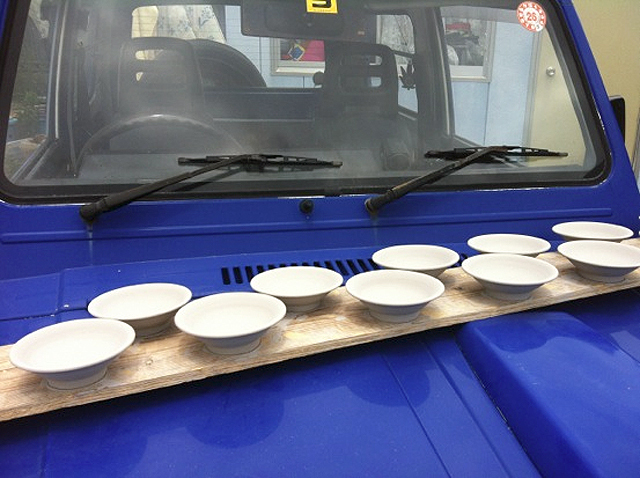 While searching for a new potter we had been told about, we had a surprise encounter with round white dishes drying on a beautiful old blue Suzuki jeep, younger sister to our own old red one. Blue and white always comes in unexpected places. 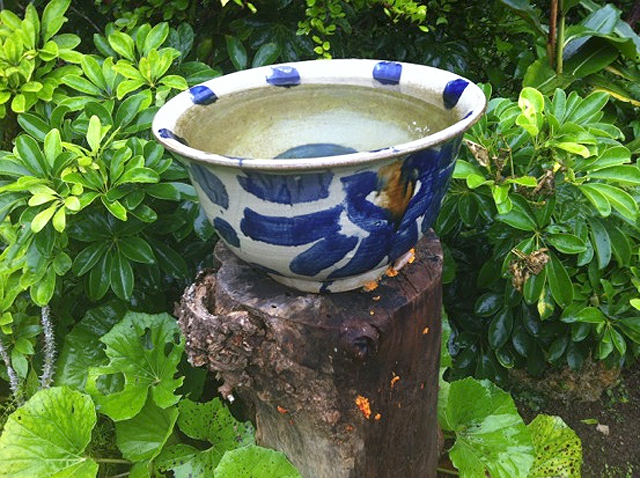 The combination of blue and white pots in a rain drenched garden of Yamada Shinman is unsurpassably beautiful and only confirms my theory that blue and white in use is far more beautiful than simply lined up and “looking pretty” on display. The same holds true for circles. They are far more beautiful at work. Aren’t we all?! Yamada san’s brushwork is free and bold and powerful. He is a master of blue and white. 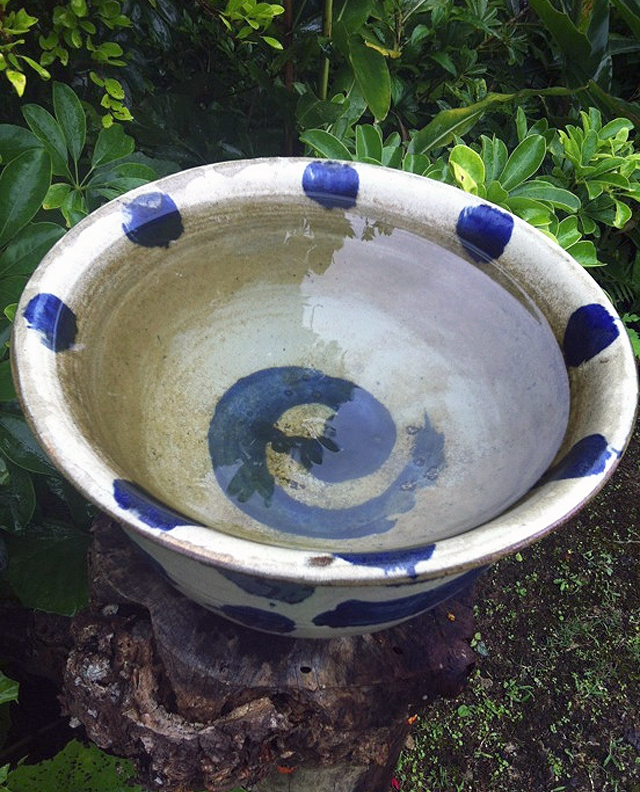 Shinman Yamada draws inspiration from his own wild garden around him when making pots and painting his natural designs in blue and white. 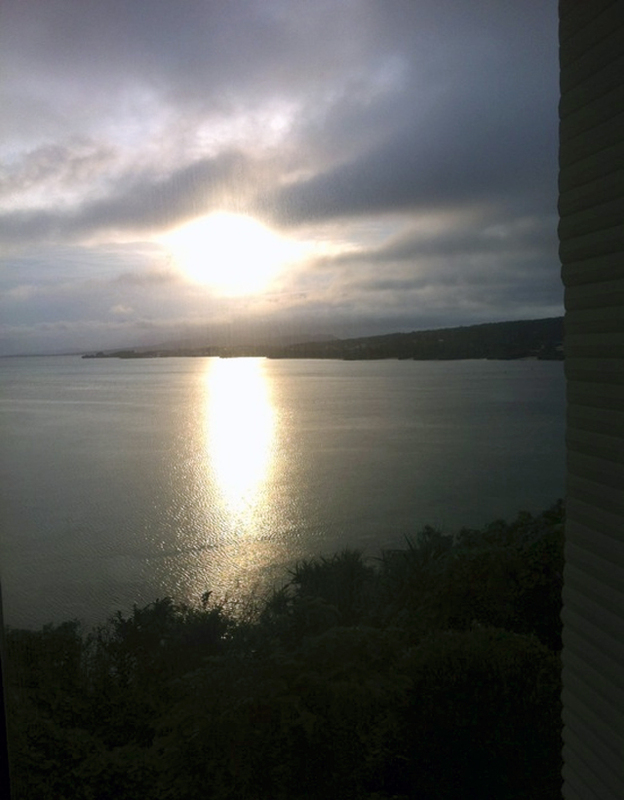 The ultimate sphere: a luminous sunrise during Okinawa’s rainy season. 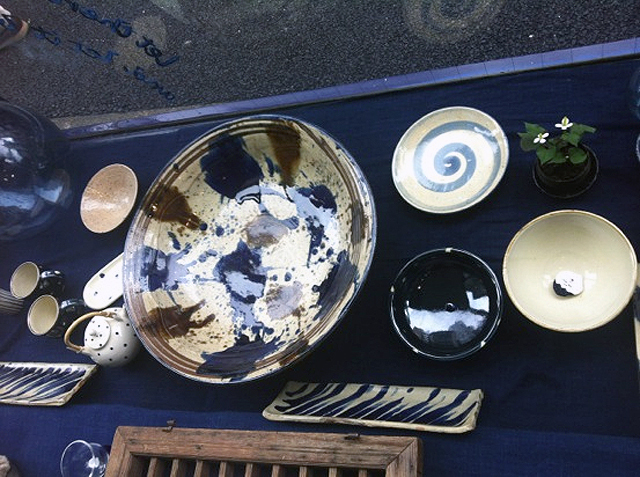 Back at Blue & White, Okinawan circles and works by other potters draw the attention of passersby. 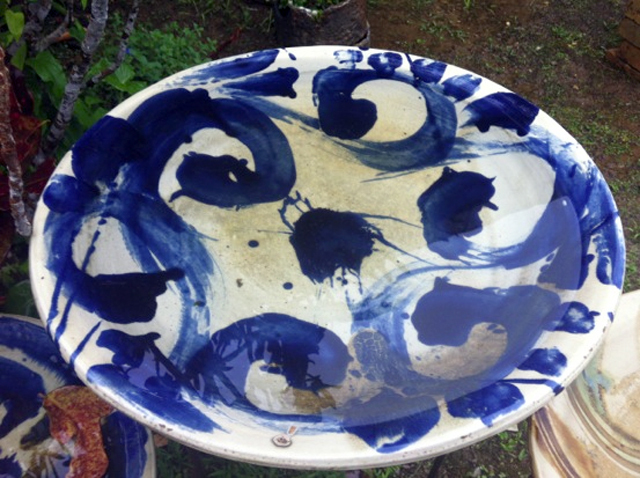 Here the huge splotchy platter of Hiroshi Matsuda is fresh and spontaneous. 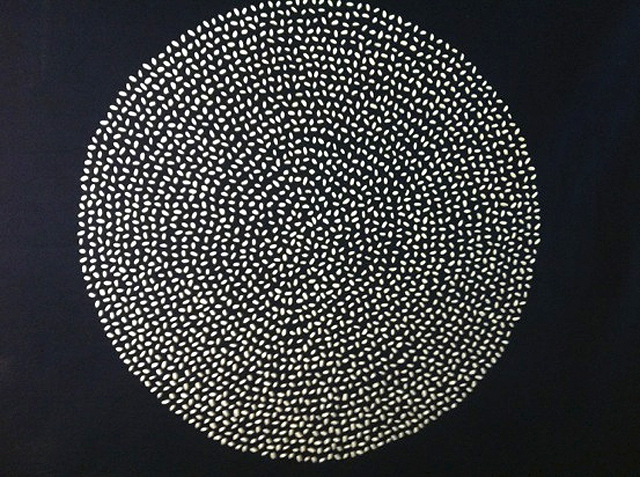 And the perfect circle of thick random sashiko stitches on indigO cloth by Kazuko Yoshiura is the pride of Blue & White. 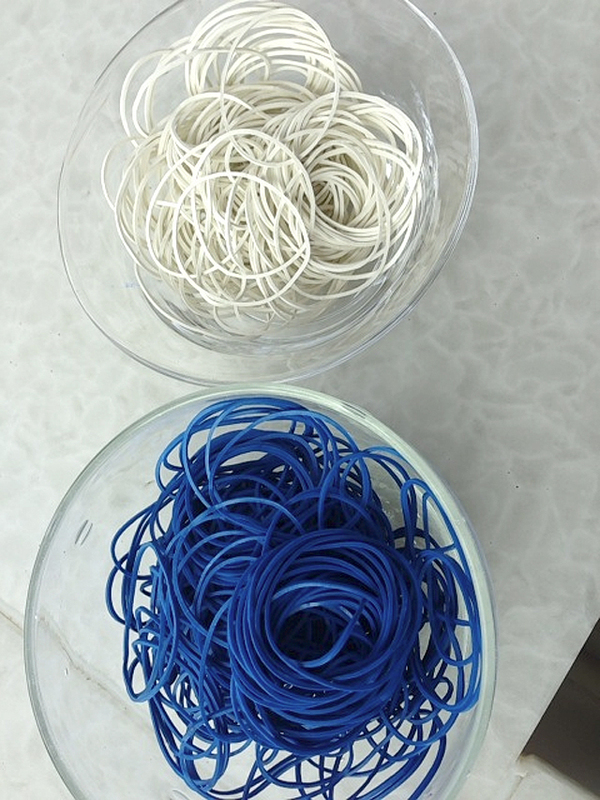 Even mundane rubber bands sing the song of blue and white circles. Why my fixation on circles? I wondered and discovered that the significance of ENSO Zen Circle is Absolute Enlightenment. The wholeness of spirit. 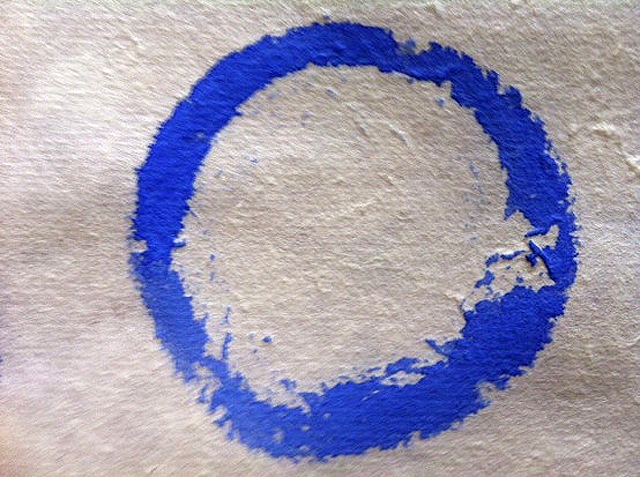 The way you paint the Enso is the way your life is now. Mine is clearly wobbly. Thanks so much for another beautiful and inspiring post. Oh my goodness, that stone in the first picture is magnificent. My husband and 17ywar old son are greatly looking forward to visiting you next week, from Australia. It’s been a while in the making – this little plan to come and soak up the beauty of your artistic offerings, in person, and hopefully take home some souvenirs! 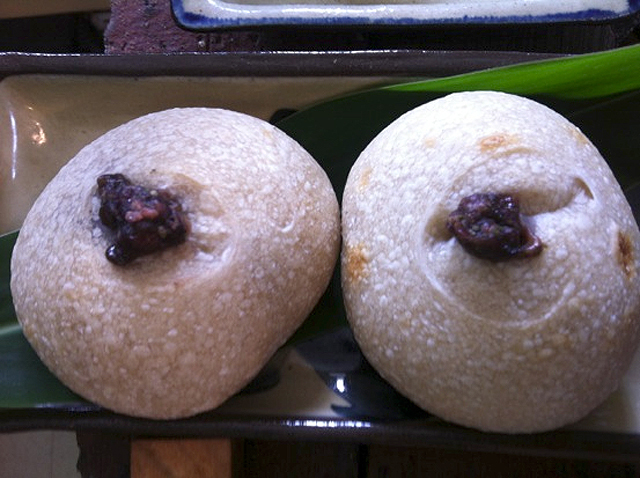 On my “bucket list” is a return visit to Okinawa. I know that I will look at it through different eyes than I did as a new military wife. Having lived in Beppu, where I explored Japan through civilian eyes, I now yearn for the opportunity to revisit Okinawa and to visit Blue and White and other new areas of Japan. Fill your bucket with wishes and one day they will come true. 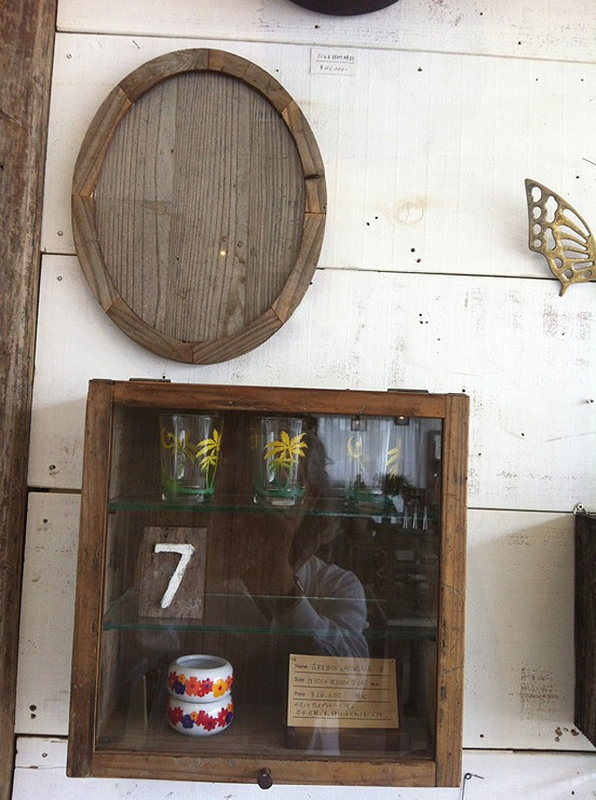 Particularly for one like you who has explored Japan through many sets of glasses. Thank you for these beautiful reminders of a country where my sOul belongs. How right you are, Carol Ann. 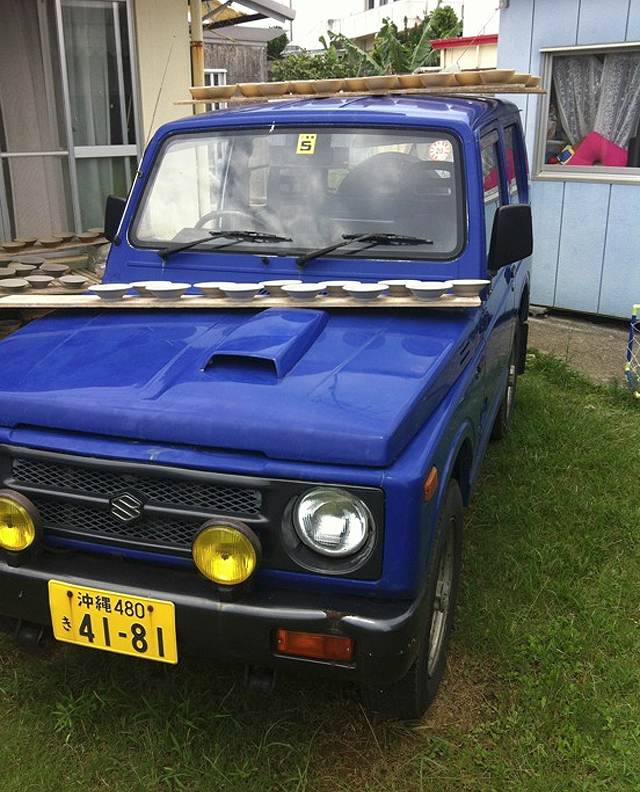 Japan is a resoundingly soulful country for people of your sensibility. I have just come home from walking the dog and found groups of young men dressed in bright green T shirts all diligently cleaning up after the mammoth Matsuri – festival – that took place over the weekend. All was tidiness and order. Even the bursting trash bags were piled neatly at the street corners and no sign of the giant three day festival remains. How glad I am to live here ! 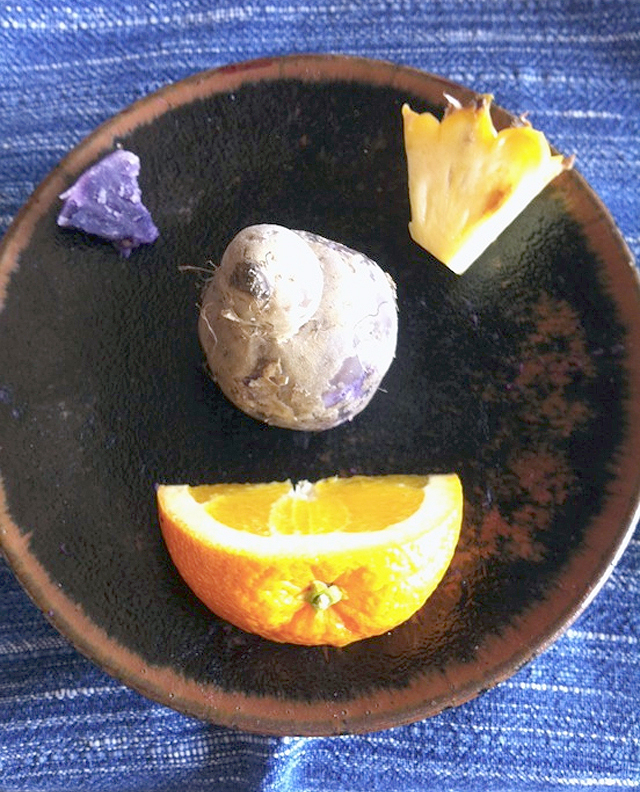 Thank you so much for sharing your beautiful expressions of those treasures we often take for granted. You are able to allow me to see things with new eyes. I started following you after receiving a lovely gift from your store. And now I long to return to Japan to actually visit the store and perhaps get to meet you. You are gifted with a kind heart, a keen eye, and a wonderful writing ability. Oh my heavens Pat ! Have you and your family come and gone and I missed you ? I have just found your comment on our Circles blog and I feel very badly that I wasn’t here to greet you. Hope you had a great time in Tokyo anyway and that you were well treated at Blue & White. Sorry I missed you !